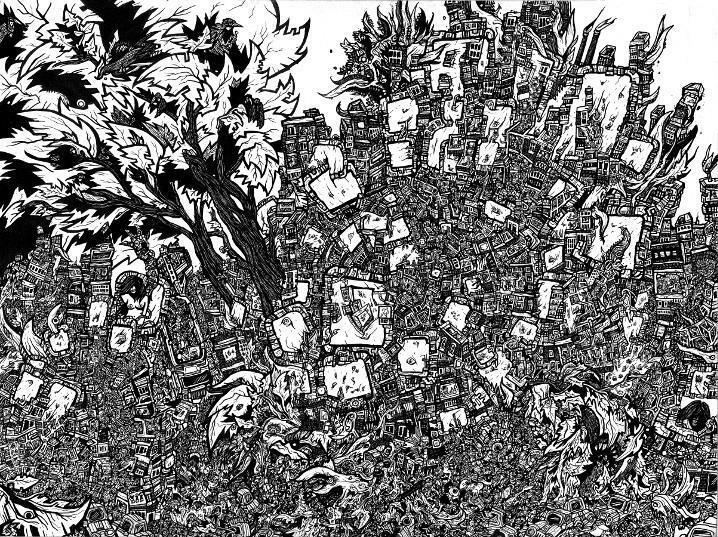 INK ART Selection of the most intricate and insane drawings from the City of Gears! Fine art Prints are made with heavy-weight archival paper & inks featuring the most accurate reproductions capturing every last detail of the original works. These prints are available in two sizes: 18” x 24” and full sized 30” x 40”. Each print comes signed and exclusively numbered in a limited edition. 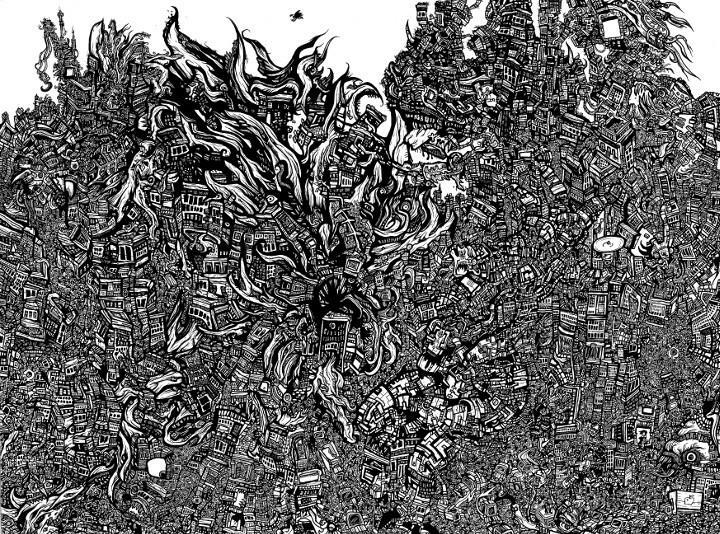 “The Sound of the City” (ABOVE) is an extremely detailed pen and ink drawing of the monstrous metropolis. 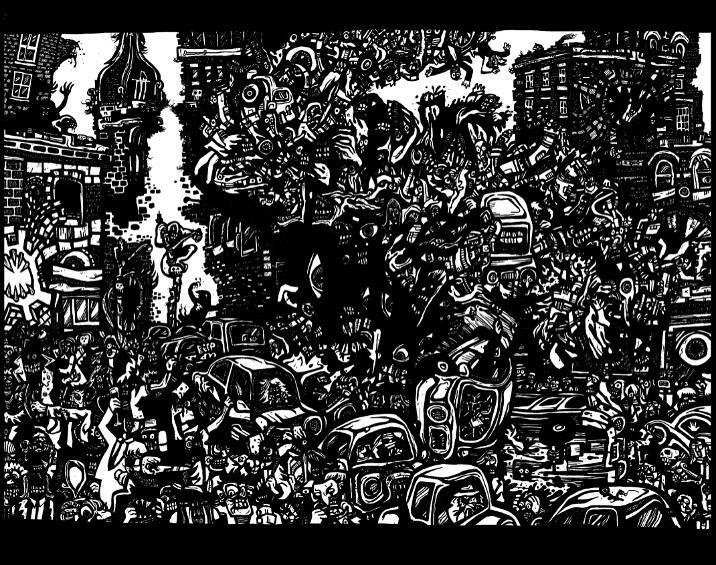 The artwork depicts all noisy congestion and excitement of the big city. The various areas and activities collide and combine including the busy stomping of sidewalk shoppers, the blasting music and boasting bargains of the storefronts, honking horns and screeching tire traffic jams, the endless activities in apartments, alleyways, offices and skyscrapers. The entire ordeal is presented as a medley of shapes and experiences mixing together to reveal the secret image of a giant trumpet. As all the video screens, billboards, televisions and devices spiral around the city meddling with our routines two towering trees stand tall in protest reminding us of a world forgotten but that far away. 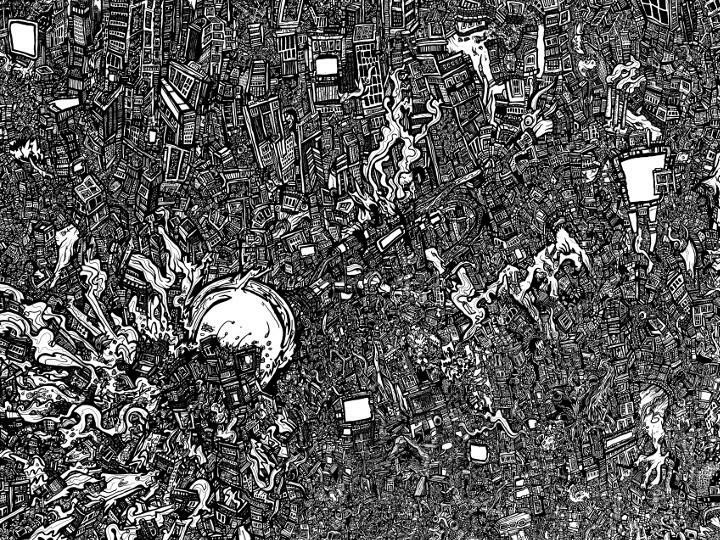 This intricate pen drawing feature hundred of tiny apartments circling each other like a giant vertigo building. Each little room contains a uniquely detailed cartoon scene depicting various weird characters and activities resulting in an artwork that is both expressive as a whole and endless filled with small treasures. The original ink art was 30” x 40” and took over 250 hour to complete. In a desperate act of retaliation Mother Nature rises from the ground taking the shape of a giant dragon worm. With hundreds roots and weird organic creatures as her allies she smashes her way through the cities streets ready to do battle with metropolis's giant Robots! This detailed artwork deals with the theme of Nature vs. Technology. I always choose a small concept, sentence or story before creating my drawings. Once I have the initial inspiration I just start doodling away at let the illustration dictate itself. In this work there are endless contrasting personifications meddling mechanical and organic shapes to create secret faces and strange little situations hidden all throughout the work. Strange business meetings, suicidal superheroes, weird architecture and clouds with giant eyes rule this surreal city! As the citizens fill the highways and sidewalks an unseen world of edible credit cards, mythological monsters and escalators to nowhere thrives in every building. Revealing all sides at once the living breathing metropolis becomes a polymorphic monstrosity! 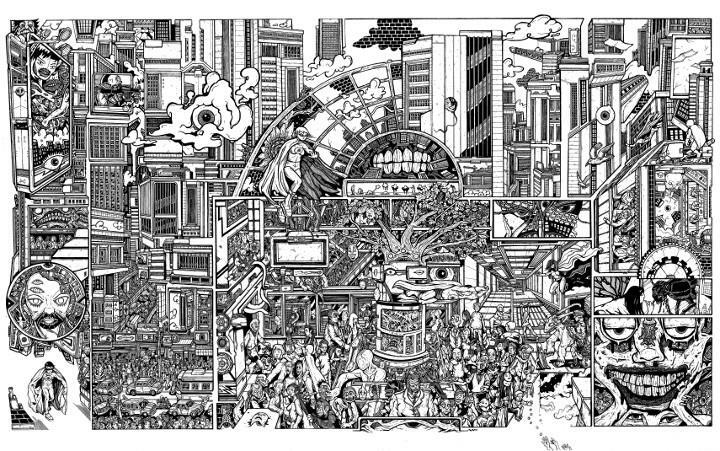 This meticulous ink art illustration takes a peek inside the towering buildings to reveal the unusual activities that make up the city's routines. I approached this work as an abstracted comic book page using a variety of camera angles and panel layouts to investigate secret parts of the city no one else has ever seen. "City Monster" Ink Art! All the people, cars, wires, buildings and energy collide in the center of the busy downtown streets. Like some cosmic calamity these forms begin to melt into one another giving shape to a new collective consciousness. A crowd of entangled shoppers take the shape of a giant arm as this strange creature assimilates everything in it's path. Suddenly a giant eye opens, then a mouth and a scream! Rise Ye Mighty City Monster!!! 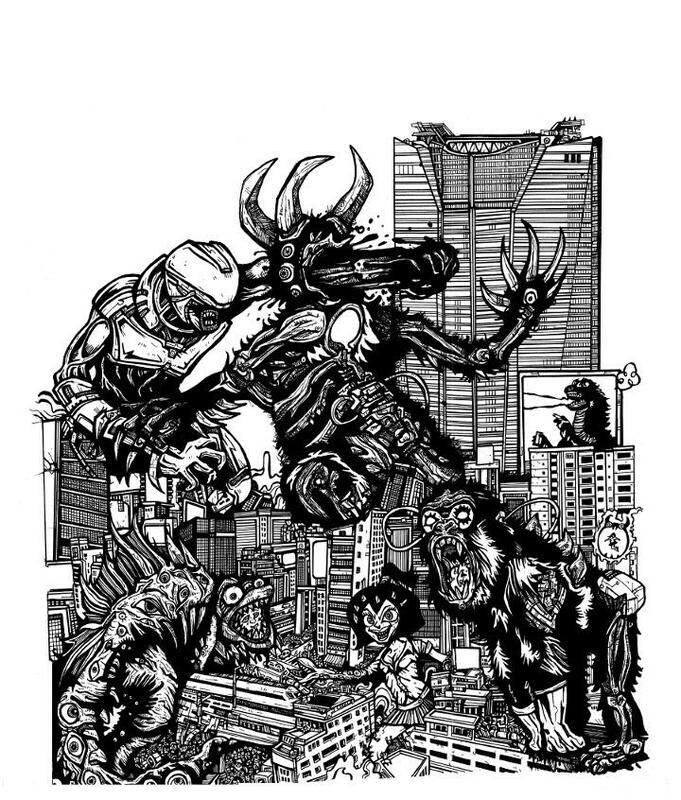 Depicting all the monstrous energy and interconnected activities of the big city, this detailed drawing is always one of my favourites. I took painstaking time to flesh out each individual character caught up in the chaos while using all of the little stories to create the bigger beast. 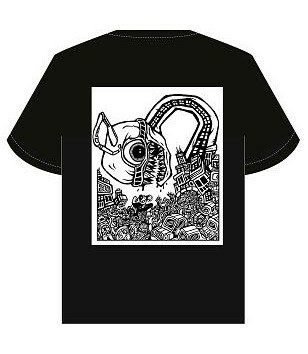 MONSTER T-SHIRTS Surreal City Strange Creatures and Exploding Heads!